Everyday I see patients who are coming to the eye doctor for the first time in years because they noticed they just weren't seeing as well as they used to. Well imagine what it feels like when the doctor looks at your screening tests and performs the refraction, and then tells you that you have a medical condition that will prevent you from seeing better, even with glasses! 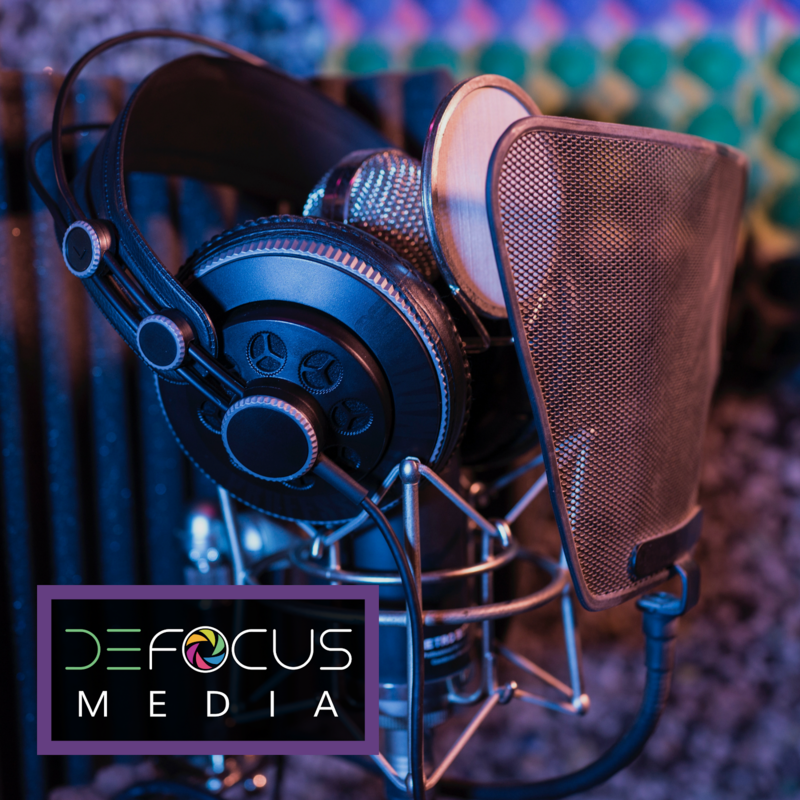 Keratoconus is a condition that affects less than 1% of the American population, but it causes major visual issues that sometimes require intensive surgery like corneal transplants to treat. It typically affects people between their late teens to late 30s, and usually progressively worsens as the eye continues to change with age up until our 40s, when the condition appears to stabilize. In that period of 20 years where the cornea is susceptible to progression, people often end up needing surgery or at least speciatly contact lenses to achieve their best vision. Keratoconus is a degenerative corneal condition where the corneal tissue gets thinner over time, allowing the curvature of the cornea to drastically steepen. In layman's terms, the cornea begins to steepen like a small mountain. The result? Lots of visual distortions and a large amount of astigmatism. For more information about astigmatism please see this post. 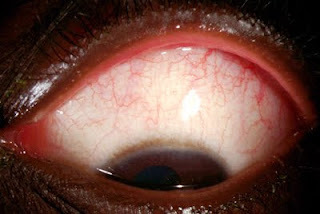 The "cone" or steepened section of the cornea typically occurs in the inferior region of the cornea, so frequent eye rubbing appears to cause more and more progression of the condition. 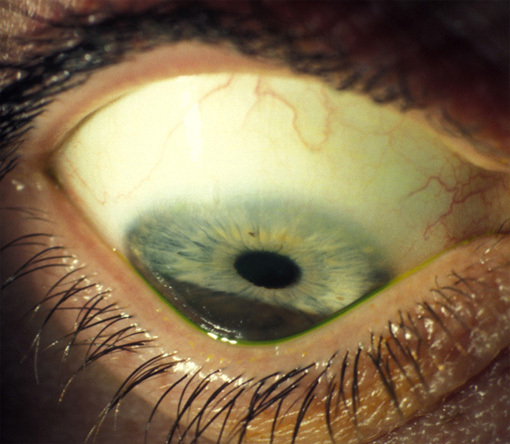 steepened cornea causes the eyelid to be pushed outwards. Your doctor can see keratoconus by looking at a number of readings. Anyone with high astigmatism is suspicious for keratoconus (usually above 4.00 DC). Keratoconus can also be visible by obvious steepening of corneal curvature (best seen with downgaze as shown above). This is called Munson's Sign when the steep cornea pushes the lower eyelid outwards. Often keratoconus causes typical scarring patterns on the cornea, but in early cases this may not have developed yet. 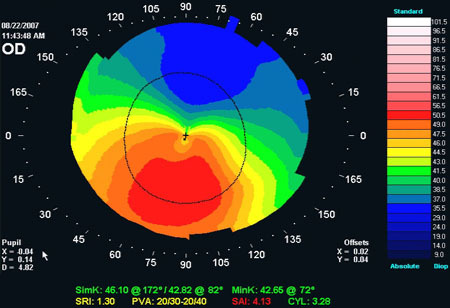 The most definitive way, however, to diagnose keratoconus is to use a corneal topographer. 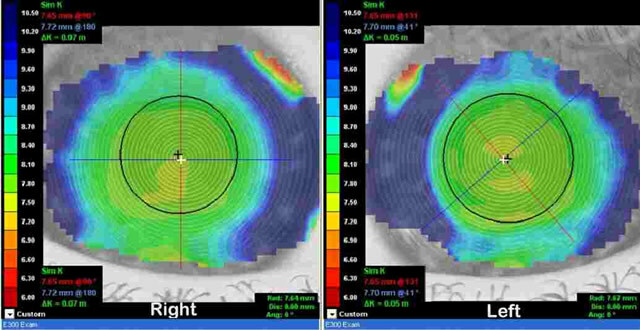 This machine basically maps the curvature of the eye, revealing a tell-tale red "cone" of steepening in keratoconus. In early cases, glasses and contact lenses can be enough to correct vision. As the condition progresses, however, speciatly contact lenses are often required. Lenses like RGPs (hard lenses) and Synergeyes Clearkone are frequently used. Surgical procedures are becoming increasingly more common for treatment: Intacs and corneal cross-linking seem to be the future for long term cone stability. In very advanced cases a full corneal transplant is required. In any person with keratoconus, I always recommend avoiding rubbing the eyes, because external force has been shown to continue to weaken the already fragile corneal fibers. More info to come on Corneal Cross Linking in a future post! Very nice article. Information on http://www.newintacs.com may be useful.